My latest novel took me to a used bookstore that is a home-away-from-home for its quirky employees and eccentric patrons. The book’s opening scene features Joey, one of Bright Ideas’ most regular customers, dangling from a noose. His body has been discovered by Lydia, the lovable and loyal bookseller. As Lydia lower Joey’s body from the rafters, she discovers a photograph in Joey’s pocket. Is this a clue to the reason for Joey’s suicide? No….it actually raises more questions because the picture was taken at Lydia’s 10th birthday party — and was one of the last times she saw her friend Carol before she was tragically killed. Why does Joey have this picture? He and Lydia first met a few years ago…..long after her birthday celebration. Lydia’s story is not without complication as well. As a young girl, Lydia was having a sleep over at Carol’s home on the night that their world would be turned upside down. While playing in a blanket tent in the living room, Carol and Lydia witnessed a stranger enter the house with a hammer in his hand. As the girls heard the sounds of Carol’s parents being murdered, Carol raced to aid them and lost her life in the process. Lydia found a hiding place under the kitchen sink and escaped the Hammerman’s violent rampage. The criminal’s identity has remained a mystery ever since the murderous night and has crippled Lydia in the process. 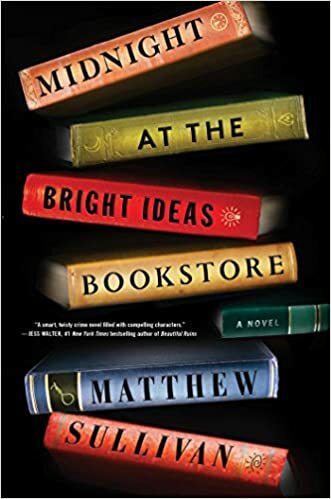 Midnight at the Bright Ideas Bookstore weaves together the two mysteries of Joey’s tragic suicide and the Hammerman mystery into one story effortlessly. It is an exciting read that will keep the audience glued to its pages until the final revelation is made in the closing chapter. Thankfully, the violent scenes were not explicitly graphic and a welcome change of pace for my reading adventure. The February selection for the “Reading with Jacqs” project was The Curious Incident of the Dog in the Night-Time. The book is basically a mystery narrated by a young English boy, Christopher, who is a highly functioning autistic. The mystery begins with the death of a dog, Wellington, that our narrator finds with a lawn fork stuck in him. His search for the cause of the dog’s death leads to the instruction by his aggressive father to “stop sticking your nose in other people’s business.” Christopher decides to write a book detailing his search for answers. When his father trashes the manuscript as a punishment for Christopher’s persistent search for the dog’s murderer, the search for his prized notebook leads to an unexpected discovery that shapes the course of the rest of Christopher’s adventures. Mark Haddon eloquently expresses the quirkiness of an autistic boy and takes the reader deep into the inner-workings of the mind. Every detail of the book — including the numbering system used for the book’s chapters — are designed to paint a clearer portrait of our main character. At times difficult to process because of the tangents Haddon’s writing includes, it quickly becomes clear that we are seeing the world through the eyes of the disorder. What I found most intriguing is that the novel is not about the disorder; autism is simply a fact of Christopher’s life that partially defines him. Although I don’t normally read mysteries, I found myself immersed in the tale of Christopher, his family relationships, and the curious incident that links them all together. What’s next on my reading list? I’ve just begun Trevanian’s The Crazyladies of Pearl Street. I’m hoping to make a nice dent in it during tomorrow’s snow day from school.